Pet tags have been used by military officers since ages as a sort of recognition tag. And this tradition has been carried on and today most dog owners love to use custom dog tags jewelry for their pets; which is useful as well as very attractive. These jewelry are usually used in the form of pendants and made from a material such as stainless steel and pewter. Pets are lovable and important part of a family. The greatest fear among pet lovers or pet owners is that there are chances that their beloved pets will get missing. Many smart pet owners use Pet ID tags. When it comes to ensuring your pet will be found in the event it is lost, you will be amazed at how the world of pet id tags has advanced. They are durable, waterproof, lightweight and wear resistant. 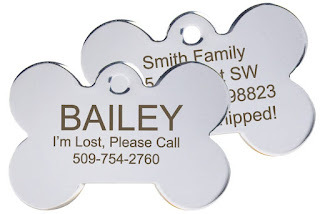 Many vendors can offer you the option of customizing your very own pet tag. Though made from many different types of materials, stainless steel is a tried and true material that will not rust or fade. In addition to having your pet found, you could also get a pet medical ID tag that can identify your pet's special needs and conditions. They are great for people who breed dogs or for veterinary uses as well. Nearly all pet id tags will not discolor the coat of light colored pets. You can actually get rubber silencers that cover the tag to prevent unnecessary rattling and are available in many awesome colors. Stainless steel tags are polished and can be engraved with all of your pets important information, such as name, address etc. You can also get brass tags that can be engraved and will be durable but not as long as stainless steel. Also, Plastic pet id tags are lightweight and colorful and give excellent visibility for your pet. 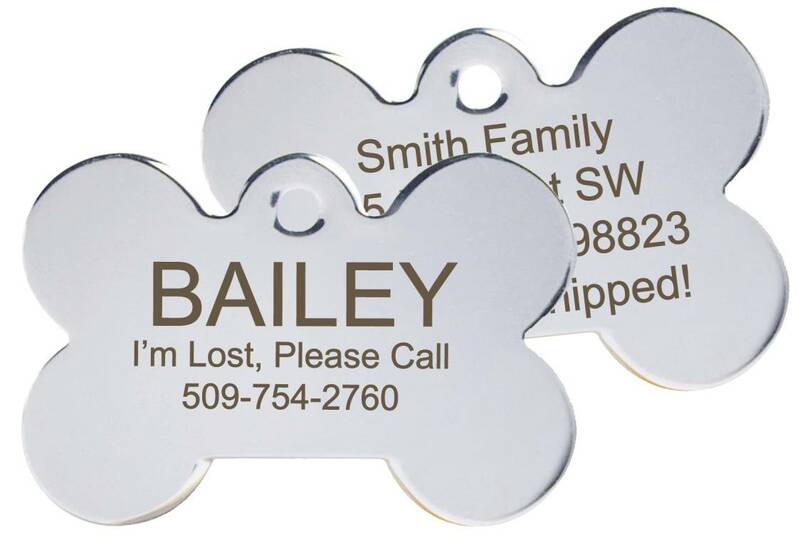 If you want to have your pet look shiny and sharp, you may want to consider an aluminum tag and they are also available in many bright colors. This type of tag is more applicable for an indoor pet. Considering the sobering statistics when it comes to lost dogs, your pet should not be without one. Did you know that there are about 60 to 65 million dogs and cats in the United States? Every year there are more than 10 million entering U.S. shelters. In addition to this, only 17 out of 100 dogs in a shelter are ever united with their owner again. Not only will pet id tags bring you peace of mind but they can also ensure your pet's medical needs will be taken care of if found by a caring individual. To ensure positive ID for your pet, you should include separate lines for such items as the pet's name, owner's name, address, city, state, and zip code along with all important phone numbers. Remember to also include an extra line for medical, reward and veterinarian information also. If you want to buy this pet id tags, I highly recommend you purchase online through Amazon at this link. It's currently on sale here only through Amazon.